Wilderstein offers an enchanting, elegant, country setting for outdoor daytime wedding events. The estate’s magical Queen Anne mansion and landscape provide a beautiful backdrop for ceremonies, receptions and wedding photography. 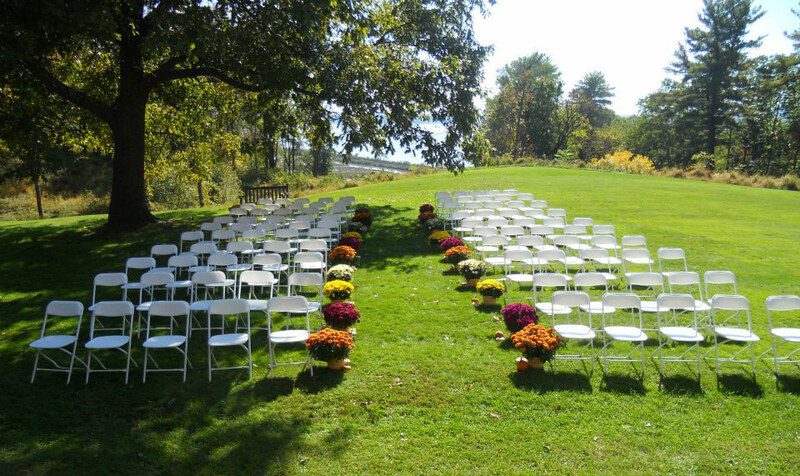 Ceremonies may take place anywhere on Wilderstein’s picturesque 40-acre landscape. The expansive lawn east is available for wedding receptions. From this location, guests have spectacular views of the Esopus Lighthouse and Hudson River. For more information or to schedule a walk-through of the grounds, please contact the Wilderstein Office at wilderstein@wilderstein.org or 845-876-4818. Fees for all other commercial photography, professional portraits, etc. are by arrangement through the Wilderstein Office. Please see our list of Business Members for local vendors to help you plan your perfect Wilderstein Wedding. We are also happy to suggest additional local vendors familiar with our property and policies. Q: How can I check available dates? A: Call the Wilderstein Office at 845-876-4818 or contact us by sending an email to wilderstein@wilderstein.org. Q: When may I look at the site? A: An appointment to meet with a Wilderstein representative to be shown the grounds can be arranged by contacting the Wilderstein Office. You may also visit Wilderstein’s grounds on your own daily from 9am to 4pm. A: Wilderstein’s fees cover the use of the grounds. Arrangements for tents, chair rentals, food service, etc. are the responsibility of the event holder. We are happy to suggest local vendors familiar with our property and policies. Q: What types of decorations are allowed? A: Flowers, shepherd hooks and candles may be used, although there are restrictions as to how many and where they are placed. Use of natural products (birdseed, flowers, bubbles, etc.) is permitted. The mansion and verandah may not be decorated. Q: Is there a place for the bride to hideaway until the ceremony begins? A: Wilderstein has a location that can be made available for the bride to hideaway until the ceremony starts. Q: Can wedding photos be taken inside the mansion? A: Photography is allowed on the verandah and anywhere on the grounds. Wedding photography is not permitted inside the Wilderstein mansion. Q: Are bathroom facilities available? A: Wilderstein has bathroom facilities which are available for wedding ceremonies. For receptions, portable restrooms must be brought in. Q: Is there a designated tent location for wedding receptions? A: Tents are permitted only on the east lawn directly in front of the mansion’s porte cochere. Q: How long and between what hours may the grounds be reserved for my wedding ceremony and/or reception? A: Wedding ceremonies up to 3 hours between 9am and dusk. Ceremonies and receptions up to 8 hours between 9am and dusk. This time includes all set-up and take-down. Arrangements for day before set-up and rehearsal possible.